Beautiful to look at, and just stuffed full of wonderful ideas, designs, and instructions! 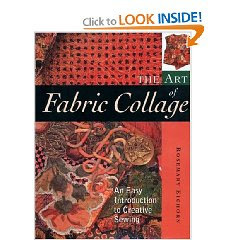 The Art of Fabric Collage is subtitled "An easy introduction to creative sewing". I'm not 100% sure about the "easy" part, but the instructions are so clear and complete, that I definitely believe that a beginner sewer with determination will get a lot out of this book. As for intermediate or better sewers, I think this book has the potential to open your eyes to new ways of using your machine. Rosemary steps you through the process of adding all kinds of interesting fabrics to a background. Once this piece is washed and dried, the edges become softened and interesting, and the new fabric can be used in all kinds of creations. Fabric collage, which was developed by author Rosemary Eichorn, is an inspiring quilting method that allows crafters to experiment with color, design, and fabric while learning to sew. This inspiring, innovative method for the beginning sewer includes complete, easy-to-follow instructions and dozens of beautiful color photographs of finished pieces. Several surface design techniques are explored, including free-motion stitching, soft-edge applique, and continuous-strip prairie points. Leave me a comment below and next Wednesday, Sept 16, I'll randomly pick a winner! I am inspired by the techniques I want to learn. I am a sewist, quilter and teacher. Fired with the desire to learn new art processes. Ohhh this looks like a book I might enjoy and one I hadn't heard of, so thank you for the heads up! I appreciate your reviews and comments. It's nice to have an opinion other than the publisher"s.
thank you for the opportunity to join in! i really like what you are currently working too...your organic quilt shapes are beautiful! I'd love learning some new fabric techniques. Sounds like a fabulous book! Thanks for the chance and sharing all your inspiration and learning. This book sounds great. Thanks for posting the review. This looks like a great book. Thanks for sharing the info. Count me in I love new ideas!! What a nice book- count me in! I'd love to try fabric collage. Thanks for the book suggestion. I'm always looking for new ideas & new things to do with fabric, please count me in. Thanks! The book looks wonderful! Please include me in the drawing. Many thanks. This book looks like it would be fun. Count me in. The book looks wonderful, thanks for the chance to win it! I always love to hear what people think about crafting books, it's hard to get an idea just skimming through them. Thanks for the generous opportunity! How wonderful! Please add my name to the hat! Thanks! Interesting book, please throw me into the pot. Looks like something I would love to learn to do. Thanks for the opportunity! What a great idea and I am eager to try. Love your reviews and ideas. Thanks for the opportunity to win the book. Who doesn't love free stuff! Sounds like some fun techniques and projects for creatives who are more into mixed media than sewing. This sounds like just the ticket to help me with my Textile Design course. I do want to work on and up-cycle classic garments that will become unique. Thanks for drawing this to my attention. I could easily be inspired by this book !